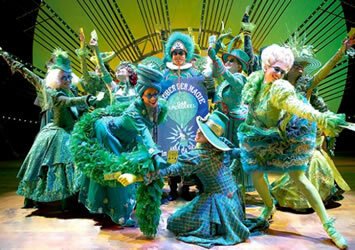 Guide to the London stage musical "Wicked"
This page is a brief guide to the stage musical Wicked. 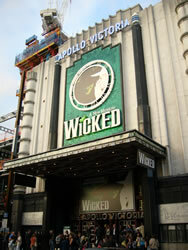 It is currently being staged at the Apollo Victoria Theatre in London's West End. The show's opening night on New York's Broadway was in October 2003, and it opened in London's West End in September 2006. 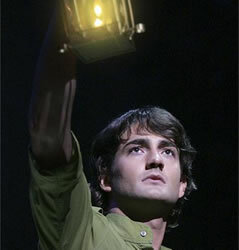 It is based on a bestselling book Wicked by Gregory Maguire which was inspired by the story of The Wizard Of Oz. If you have seen the film The Wizard of Oz (or read the book), you may think that you already know the story about Dorothy, the Scarecrow, the Tin Man, the Cowardly Lion and their journey to see the Wonderful Wizard of Oz. But there are always two sides to any story - maybe you haven't been told the whole truth. 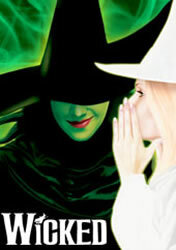 This musical tells the story from the perspective of Elphaba, the girl who becomes the Wicked Witch of the West. 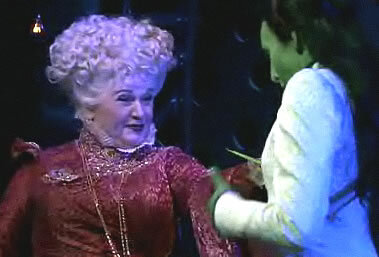 Was she really as wicked as she seemed in the film? - Who was the Wicked Witch of the West? What kind of childhood did she have? Why is her face green? How did she get her pointed hat and black cloak? How did she end up living in a castle in the mountains? - How did her sister the Wicked Witch of the East get those beautiful jewel-covered shoes? What is so magical about them? 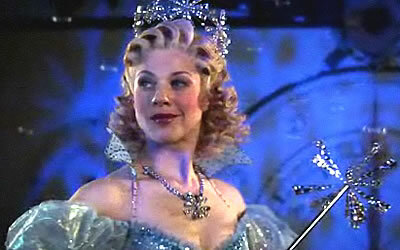 - Is Glinda the Good perfect, or is she just living in a bubble? How did she get her wand and learn magic? - Who is the Scarecrow? How did he end up without a brain? - Who is the Tin Man? What happened to his heart? - When did the Cowardly Lion lose his courage? Will he be brave enough to appear in this show? - Is the Wizard of Oz really so wonderful? If you haven't seen the film, or you saw it a long time ago, you may want to read the summary of that story first, or watch the DVD before you go to the musical. See the section below called "The Wizard Of Oz". The running time (including one 20 minute interval) is 2h50. 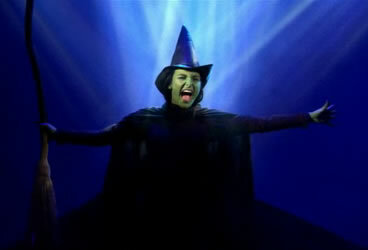 Elphaba: A girl with green skin who eventually becomes the Wicked Witch of the West. Her father is the governor of Munchkinland. The name Elphaba is based on the sounds of the letters LFB, the initials of the author of The Wizard of Oz (L. Frank Baum). The songs featured in the musical are as follows. They are in the order in which they are sung. Click on the links to see the words to each song. Popular! You're gonna be popular! So I said, "wonderful - if you insist I will be wonderful"
And a wonderful road of yellow brick"
Alternatively, if you buy the music CD (see the "Music" section above), this contains the words to all of the songs. English: Although some of the vocabulary is quite difficult in places, the story itself is easy to follow. Mood: There is a mixture of comedy and sentimentality. The costumes and sets are very colourful. 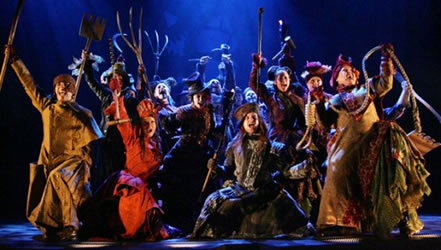 Music: There is music during most of the show, with short dialogues in between the songs. Songs are original ones written for this show. The film The Wizard of Oz was released in 1939. It starred Judy Garland (the mother of Liza Minelli) as Dorothy. It is suitable for all ages, although a few of the scenes may scare very young children. Dorothy is a teenage girl who lives with her aunt and uncle on a farm in Kansas, and has a pet dog called Toto. She has some problems in her life and dreams about escaping to a place where there is no trouble, somewhere "over the rainbow". A local lady complains that Toto bit her and demands that the dog is taken away to be destroyed. Toto escapes from his basket and runs to Dorothy, who decides they must run away together. She meets a fake fortune-teller who persuades her to return home because her aunt will be worrying about her. However, a twister (a very strong rotating wind) appears suddenly and heads towards Dorothy's house. Her family seek shelter underground in a storm shelter, but Dorothy returns home too late and seeks shelter in her bedroom instead. The wind blows out a window - she is hit on the head and loses consciousness. When Dorothy opens her eyes she is being carried by the twister up into the sky, together with the whole house. Suddenly the house lands and Dorothy gets out. She is in a strange land populated by small people called Munchkins. They are happy because the house has landed on top of a witch known as the Wicked Witch of the East and has killed her. Dorothy realises how much she misses her family and wishes that she could go back home to Kansas. Glinda the Good (the Witch of the North) appears magically from some bubbles. Glinda makes the dead witch's slippers (which are covered in jewels) move onto Dorothy's feet. She tells her to keep these on at all times and to walk to the Emerald City to seek help from the Wonderful Wizard of Oz. To get there she needs to follow a road called the Yellow Brick Road. While Dorothy is walking along the road she meets the Scarecrow, who is made of straw. He feels like a failure because he doesn't have a brain, and he is scared of fire. He joins Dorothy because he hopes the wizard can help him. Next she meets the Tin Man. He wishes he had a heart, and is scared of water because it makes him rusty. Finally she meets the Cowardly Lion. He has lost his courage. All of them walk together along the Yellow Brick Road, hoping the wizard will be able to solve their problems. The Wicked Witch of the West (the sister of the Wicked Witch of the East) tries to stop them. She wants the shoes being worn by Dorothy, and she wants revenge because of her sister's death. Dorothy and her friends enter the Emerald City. Everything appears to be green (perhaps because everyone wears green glasses). They get to see the wizard, who promises to help each of them to get what they want. However, first he sets them a task to prove themselves worthy: they must go and bring back the broomstick of the Wicked Witch of the West. They set off towards the witch's castle. The witch uses magic and some flying monkeys to capture Dorothy and Toto, but Toto escapes and leads the Scarecrow, Tin Man and the Cowardly Lion to the castle. When they confront the witch, she sets fire to the Scarecrow. Dorothy throws a bucket of water over him, but this also lands on the witch and causes her to melt. They take the broomstick and take it back to the wizard. However, they discover that the wizard has no magic powers. He tells them how he came to Oz accidentally in a balloon, and became the leader by telling the people of Oz what they wanted to hear. However, the wizard explains that they do not need magic - they just need to believe in themselves.